I am so ready for school to start back up again and I think my kids are too. Things that I have to look forward to once school starts: less whining, less sibling battles, more of a routine, a little break from kids, and so on. Things I don’t look forward to: more general busyness, homework in the evenings, and all the crazy paperwork that can quickly build up. 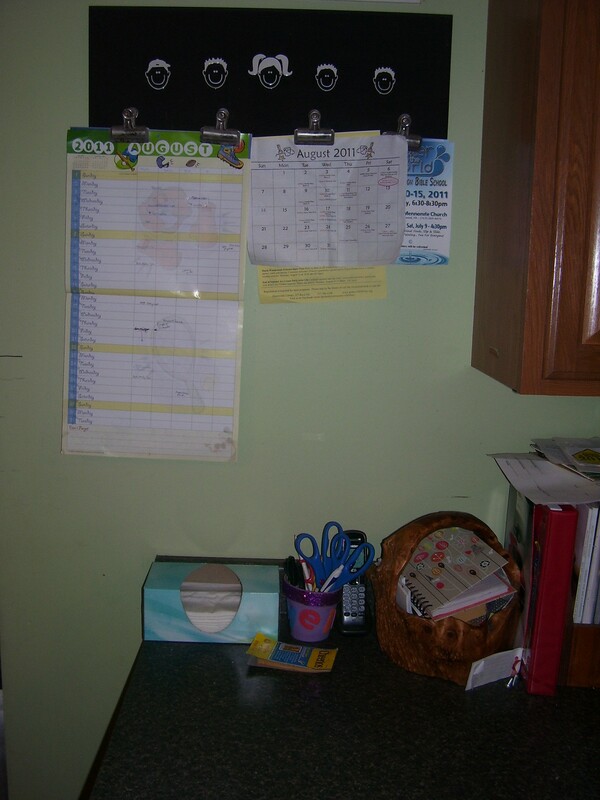 One area of my home that really needed updating before we get inundated with papers of all sorts is what I think of as my “command center.” It’s the area of my kitchen where we have our phone, calendar, and so forth and where all of our papers and mail seem to end up. No, it didn’t look absolutely, positively horrible before. However, there wasn’t a whole lot of organization and papers ended up getting piled all over the place, which drives me nuts. Plus I can’t afford for that to happen once school and all the activities that also begin with the school year begin. If I don’t have my act together things can get a bit hectic. So, I finally updated this area yesterday and was quite pleased with the results. Not too shabby, eh? The first thing I did was take everything down and clear the whole area. I threw out old papers and things we didn’t need anymore. My previous yard sale find. Remember these from one of my thrifty finds posts? 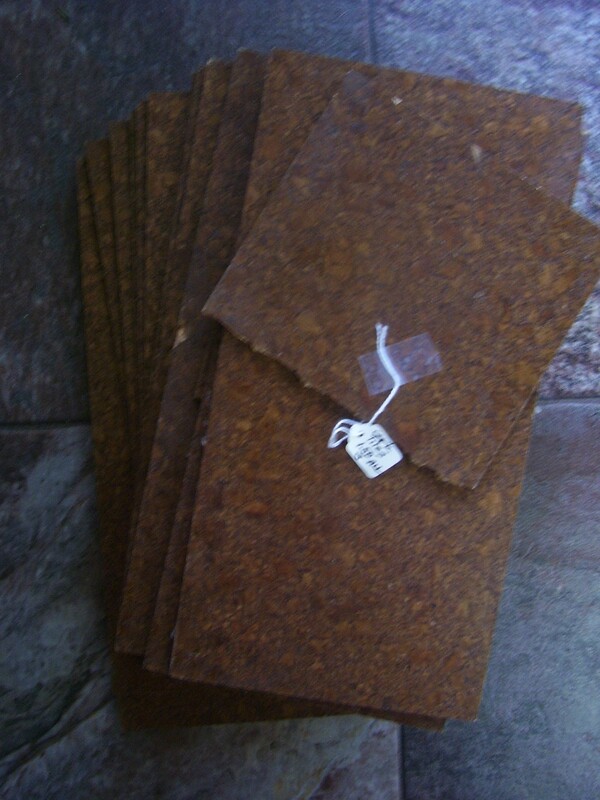 I scored this stack of cork tiles at a yard sale for $1.50. 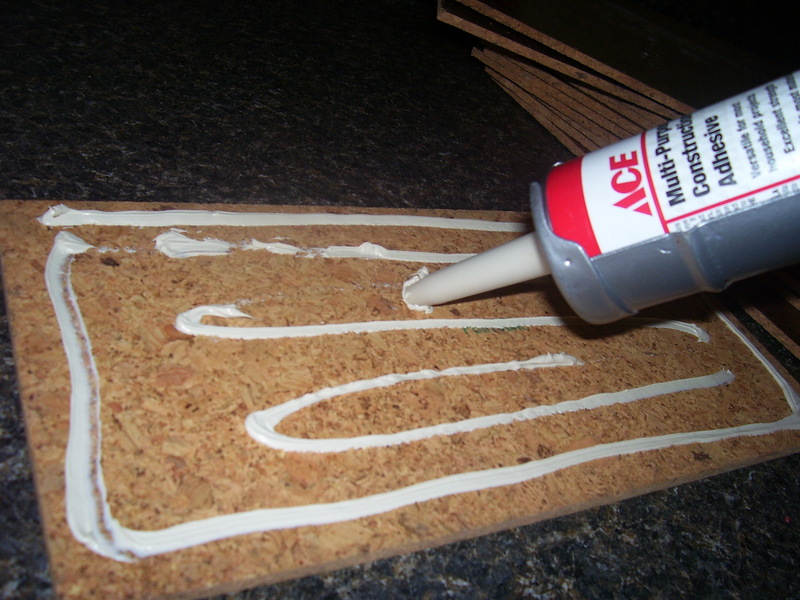 I purchased some construction adhesive at the hardware store, popped it into a caulk gun, and started tiling. 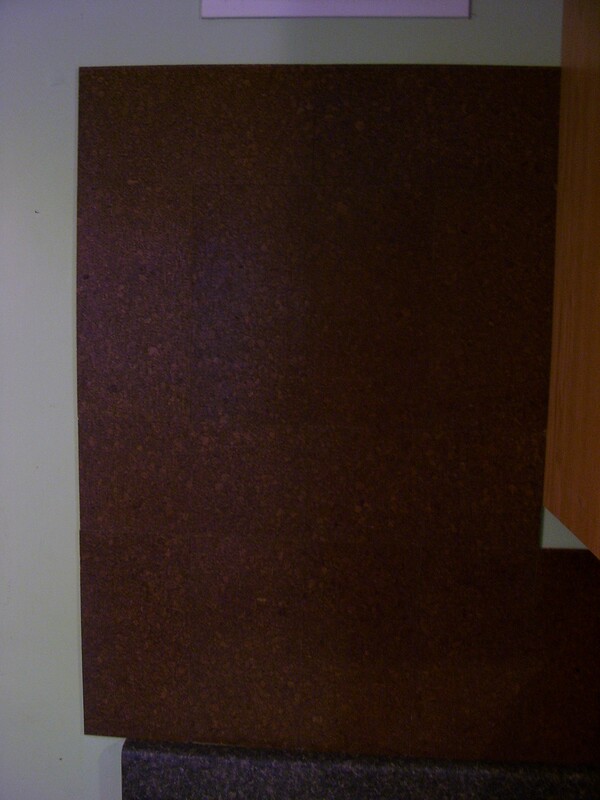 I found cork tiles to be quick and easy to install. They didn’t take super long to adhere, but I had a little window of time where I could slide them around and position them so they were flush against each other. I had just enough to cover this open area and put a bit under the cabinets. As you can see, there was a slice of green paint showing under the cabinets, so I took a box cutter and sliced a tile lengthwise to cover it (just forgot to take a pic!). I now have an entire area to pin up papers that I need to be visible. 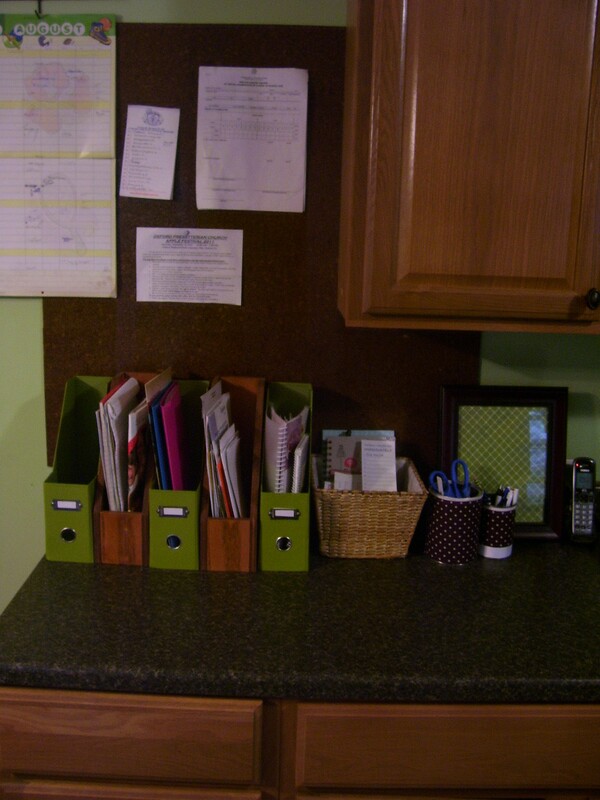 Next order of business–paper storage. 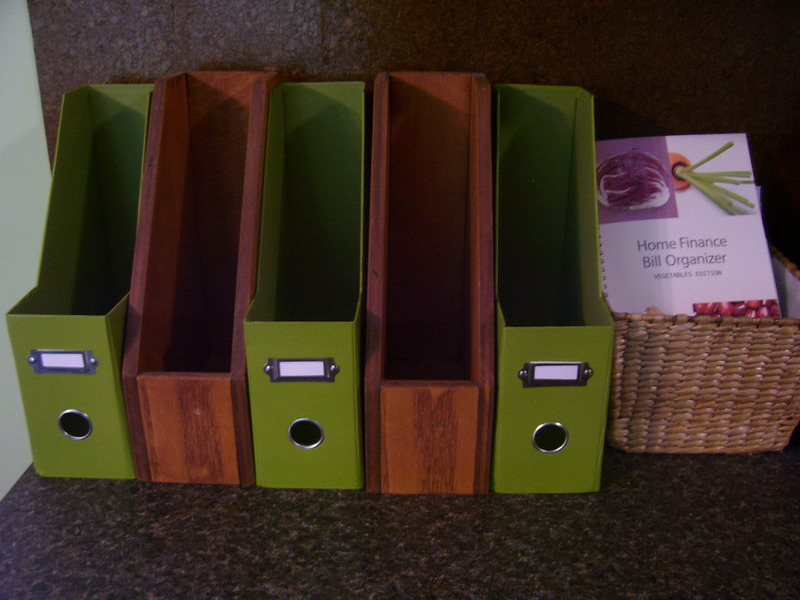 I already had two wooden magazine holders, but I purchased these green ones at JoAnn Fabric’s for @$2 each. I also placed a basket that I already owned in this spot to act as a catch-all. What I also wanted for this area was a place to write reminder notes to myself. 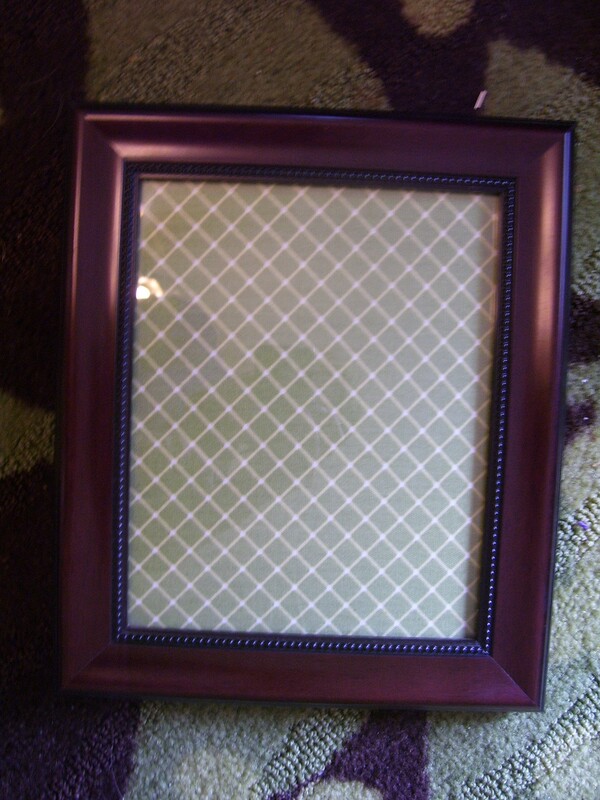 I took an empty frame that I already had, put a piece of pretty green fabric behind the glass, and now have an instant dry-erase message board. 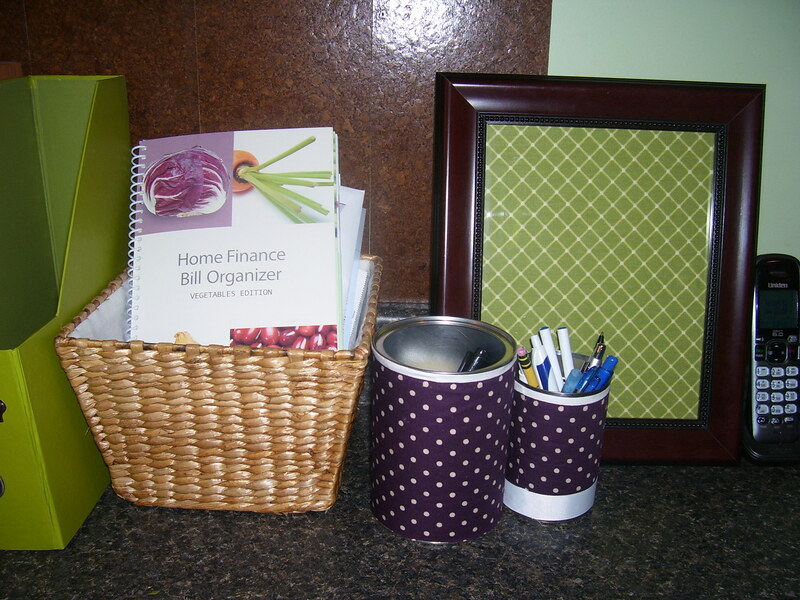 The next order of business was somewhere to store our pens, pencils, markers, scissors, etc. 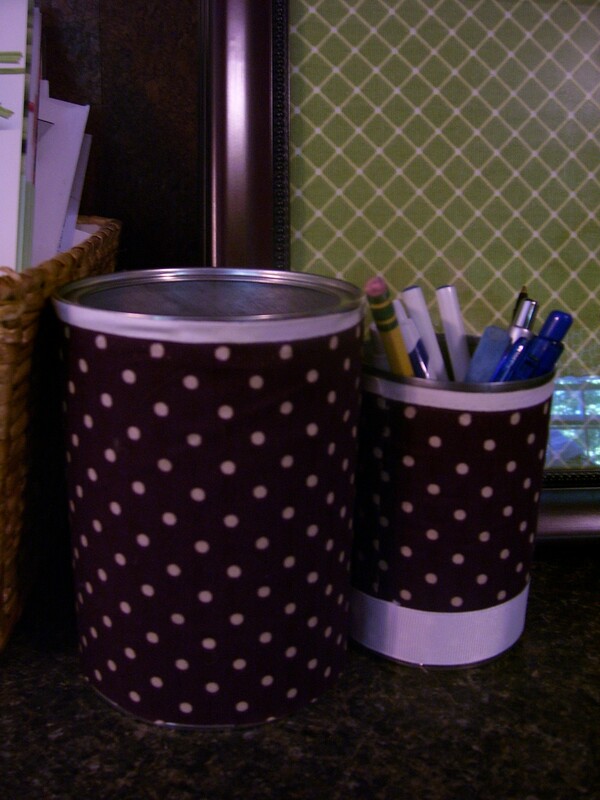 I took two clean soup cans, wrapped this fun purple polka-dot fabric around it, hot glued it, and glued a ribbon around the bottom of the one can. They are so much prettier than what I had before! I am thrilled with how my “Command Center” makeover turned out. When my husband came home, he was pleasantly surprised at our newly redone area. Now I need to keep it organized once the school year starts! Oh, to make things even sweeter, want to know how much this makeover cost me? Less than $10!! Very cool – love it!